Welcome to the first edition of Friday Five from PreppingToSurvive. We took a few days off during the holidays to relax, enjoy the time with our family, and to go winter camping. Nevertheless, we still kept up with the news and blogosphere. Here’s what we’re reading this week: Springfield Armory’s XDS is a small handgun with a big punch, 27 medicinal plants you should grow in your garden, 100 little things that will make TEOTWAWKI a bit more bearable, a drug resistant strain of malaria is found in Thailand, and another possible affect of EMPs. Even with modern medicines to counteract the disease, Malaria kills more then 600,000 people annually around the world. But the number could go up dramatically if findings in Thailand are as dire as some predict. A drug resistant strain of the deadly disease has been found and could spread throughout the world quickly. From NBC News. Homesteaders often focus on being food self-sufficient by growing potatoes, beans, and tomatoes, and cucumbers. Yet there’s a whole other aspect to growing your own food that is often overlooked: growing plants for medicinal purposes. From burns to infections, from ulcers to asthma, there are plants with medicinal properties that can help in a time of need. From Value Your Body. Many have warned of the possibility of a man-made or naturally occurring Electro-Magnetic Pulse (EMP) for years. Though no one knows for sure what will happen, the mostly like affects are massive power outages, destroyed electronics, and even permanently disabled vehicles. A new study finds that widespread fires and explosions may also accompany an EMP. From WND. Beans, bullets, and band-aids. 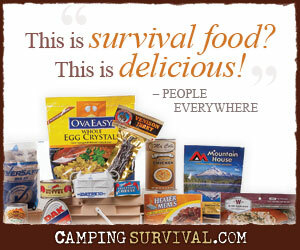 Those form the core of many preppers’ supplies. But just how many times can you eat beans before they grow wearisome? Some spices and bullion can go a long way toward making your food more appetizing. There are lots of other little niceties that can help make your surviving a bit more bearable. From SHTFPlan. Springfield Armory’s latest entry into the subcompact, highly-concealable handgun market comes with a punch. The XDS is a single-stack .45 calibre handgun that is lightweight and compact, yet shoots remarkably well for such as small design. From American Rifleman. How long can you store chocolate bars? Thanks. Good question. I don’t know the answer to that offhand. Maybe someone else will?